It was a gift! I swear! | I Should be Writing! Little known fact: Inside every Phan’s brain is a crazy Phan-girl (or boy) ready to perk up if Phantom is mentioned, seen or thought about. I’m telling you, it’s true. Yesterday I found a website that sells Phantom of the Opera (Erik) stuffed dolls. That proves it! There are people out there who are more obsessed than me. Thank God for the Internet. You’re never alone in any obsession. There are others out there–some worse than you. My better-half does not lack confidence or self-esteem. I’ve never seen him get jealous—simply because he has that much self-assurance. But, sharing the bed with an Erik doll? Not in a million years. My beloved doesn’t even have qualms about the Phantom of the Opera Broadway Box poster that hangs across from our bed with Erik’s mask dangling below it, staring at us from across the way. It’s how I obtained said poster and mask that rankles him just a little. The curtain goes down; the cast takes their curtain calls, lights come up and I’m forcibly jolted out of my make-believe lair under the opera house. With tears still making my eyes blurry, the freakin’ Phantom steps out on stage in front of the curtain. OMG! Am I hallucinating? Anyway…he tells us about Broadway Cares—Equity Fights AIDS Project and how we can donate and get a little trinket for $5.00. Amazingly, I can listen to what he is saying although I am mesmerized just seeing the Phantom (John Cudia) with all the house lights blazing. It was surreal. I could barely blink. When he finished speaking everyone rose to leave. My husband decides he has to use the men’s room before we hit the subway. What? He’s leaving me all alone in the lobby with the Phantom t-shirts, jewelry boxes, necklaces, and hats? Has he lost his mind? We designate a meeting place so we don’t get lost in the throngs and he heads to the men’s room. “Keychain Shmee chain. You want the poster.” The Phan-girl scoffs. All of the sudden, I notice I’m standing in line. At that point, I realize I’m out of control. Self-control, that is. And guess what? In order to boost fundraising, the CAST is selling items all around the lobby. My tongue feels fat, my mouth is dry. Should I do this? I can’t make a decision, but I’m next! “Hi. Did you enjoy the show?” a cast member (I think from the masquerade scene) asks me when I reach the counter. Cast Member doesn’t miss a beat, probably used to seeing tongue-tied phans. “Can I help you?” She bedazzles me with her big smile and perfectly white teeth. What are you doing? Phan-girl pipes up. You haven’t even bought anything yet! “Bracelet,” I force from my lips. There! Phan-girl, be quiet! Cast Member hands me the bracelet. I hand her the money. “Is there anything else?” she asks, her sparkly costume twinkling under the lobby lights. Say it! Say it! Phan-girl sounds desperate. “I…would like the…box poster.” I sounded like William Shatner. It’s just how it came out. I nod and pull out my credit card. It’s all for charity. It’s all for charity. AIDS is baaad. “And I’ll take a mask.” Oh crap! Where’d that come from? Shut up, Phan-girl. I’m in enough trouble. I walk out a few minutes later, the mask tucked in my purse, a bracelet on my wrist and clutching my prize to my chest. It’s backed with a piece of cardboard, but I’m still worried someone will run into me and bend it. I’m willing to elbow my way through crowd protecting it like a mother with a newborn. A mother wolverine, that is. I turn the corner and my wonderful husband is waiting for me at the prearranged spot. “There you are,” he says with his infectious grin, hazel eyes bright and happy. He comes forward for a kiss. “Well, now honey…I didn’t really buy it. It was a gift for making a donation.” I smile hoping it’s the end of the conversation, knowing it’s not. He’s okay with it. Good. But then–his eyes got bigger, he lost his smile. At that moment, he remembered how much the donation had to be in order to get ‘the gift’. I can tell he’s deciding whether or not to ruin a wonderful night (and ruin the chance of making it even better) by having an argument in front of the Majestic Theatre over something that’s already been done. Listening to his inner or should I say lower voice, he rolls his eyes, sighs and takes the ‘gift’ from my hands to inspect it. I nearly choke. I’ve been talking about seeing John Cudia as the Phantom for at least six months. I’m not joking—six months! I thought about continuing, but then I remember he hasn’t blown his top over the purchase in the first place. I’ll forget the fact that he must’ve tuned me out for six months. I can overlook that—I have a Broadway Box poster! I stare it for a moment before we start walking to the subway. I keep my wrist hidden under my sleeve. No point in telling him about the impulse purchase of a bracelet because I couldn’t get my mouth to work in front of a cast member. He’ll find it later, no doubt. “Shut up, Phan-girl,” I mumble. I’m still trying to decipher the signatures as we sit on the crowded subway with all the other theatre-goers. The man next to me, who had his nose in a book just a second before, looks up and sees my trophy. “Uh huh,” I say, smiling. Happy as a clam. “You mean phan as in ph…fan?” I ask. My mouth dropped open. I couldn’t imagine seeing it five times that year…it was only APRIL. I got very excited. I’ve never met a real Phan. As it sometimes happens when someone mentions Phantom, something unintelligible came out of my mouth. He studies me like I’ve got two heads and then looks back at his book. “What did he say?” My husband, who’s on the opposite side of me, whispers. After I told him, he leaned slightly forward to catch a glimpse of the Phan-guy. “What a nutjob,” he whispers with a scoff. I fail to tell him that the nutjob just passed me off as an incoherent nutjob. “Heh heh…yeah…some people…” I say with a sardonic grin. Maybe it’s a good thing he’s tuned out my Phantom-babble for six months. My prized possession made it unscathed through the subway and back to the hotel room. It survived the road trip home where I set it on my dresser and admired it daily—even if it clashed with the traditional decor. Things got very busy as I prepared for a move to Texas. Hubby had gone on to the Lone Star State beforehand to start his job the Monday after we saw Phantom. I didn’t have my darling framed (my poster, not my husband) soon enough. As some of the movers started in my room, I supervised the packing of the china cabinet (experience dictates this is a necessity). By the time I went back in my bedroom, boxes were all over the place and the poster was gone. I had no choice but to wait until I found it in Texas. When our household goods were delivered, I tackled any box labeled Master Bedroom first. It didn’t matter that we were still eating off of paper plates and sharing towels. I needed to get my Phantom poster framed ASAP! It wasn’t too damaged. A corner was bent a little from where they shoved it standing upright into a box of linens–oh and an extra bonus…I had found the towels. It hangs proudly on my wall. 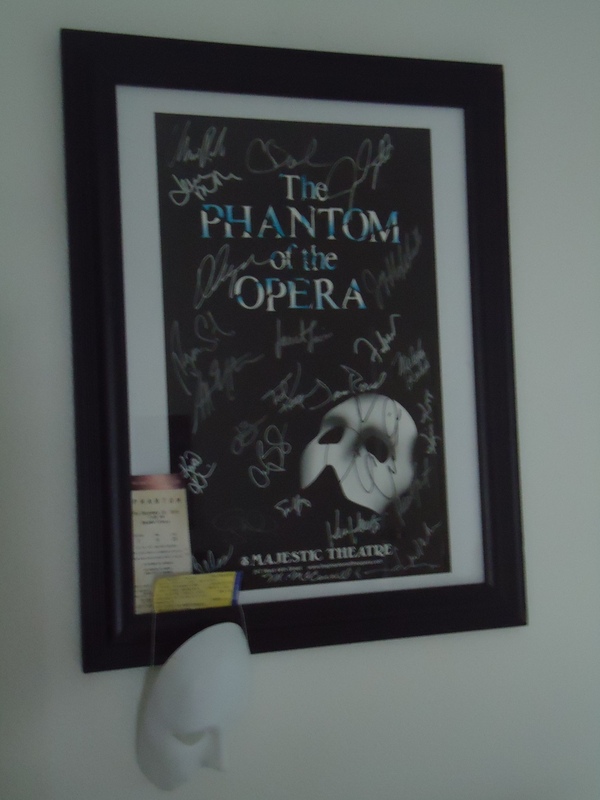 The ticket stubs are tucked into its corner and my souvenir mask hangs from them. Did I mention I had to buy a mask? The evil Phan-girl made me do it! It’s a good thing John Cudia was not behind the counter that night. He might not have just passed me off as an incoherent phan. He might’ve called secruity as I repeated, “disy disryu” while jumping over the counter in an over-heated impulse to touch his mask–just touch it. I wonder how long it would’ve taken my husband to figure out they had me in custody. He knows me well enough. Probably not long. Here is the link to Broadway Cares if you would like to donate to this worthy cause. I’m totally charmed by this story. Thanks for the giggles. I know you’ve been saying it for years, but you’re a writer, Girlfriend. Great stuff! Thank goodness your poster made it in good condition during your trip from NYC to Pennsylvania and the move to Texas. Thanks, Chris! It’s nice to know someone’s reading. I like this blogging stuff. Now if only I could get my books published. 🙂 I know..baby steps. Thanks, friend! I think Gerald deals with your Phan Obsession because he knows that, deep down, your one main life-long (well, from age 20 on) has been with him. Now, the big question is: How MUCH was the boxed poster? I’m a Goodfellow so you know that I have to ask. Ahhh…Chris, you know me to well. My picture hangs at the box office with the line: DO NOT SELL TICKETS TO THIS PERSON. What can I say?? It’s only coincidence that John Cudia stopped playing the Phantom soon after my visit, I swear. Great story! Enjoyed every bit of it. Thanks the for the laughs! Well, well, well. Just when you think you know your own child, she springs a surprise or two. As many times as I have seen that Poster, I have never asked for the story behind it. You little rascal, you. But, I enjoyed reading about it and envisioned every bit as you wrote it. This talent of yours needs to be read by everyone – maybe circulated in O MAGAZINE or another mag. Send it to them…I am telling you. This is good stuff ! Except for Erik’s mom, that is. Of course people read your blog! Even when I miss a post or two I find myself scrolling backwards for some nice archived material. You are truely a Phan-tastic Writer! Thanks, Aaron. Right back attcha…. I’m a “Phantom Of The Opera” fan, although I don’t think my devotion to the story extends to “phan” territory…. your story does remind me of something that happened to me. I attended my first sci-fi convention this year, and although I’ve usually managed to keep it together on past occassions whenever I’ve met someone remotely famous, meeting Karen Allen (of “Starman” and “Raiders Of The Lost Ark” fame) reduced me to the state of a stammering fanboy – forking over the dosh for an overpriced autographed picture of myself with her, and rushing to stammer out some banal compliments before the next guy in line got his turn… she was a good sport, admittedly. The funny thing is, I’ve got a feeling that if it was a more famous contemporary celebrity like Angelina Jolie, then I would probably have remained largely indifferent. But this was Karen Allen, who starred in B movies from my childhood days that I still have an emotional attachment to! The inner fanboy whispered in my ear and told me that I had to seek her out at the convention and fork out the dosh for an overpriced picture, I just had to! It’s not hanging on my wall though, I’ve just scanned it into my PC. Karen will just have to be satisfied with an honorary place on my facebook page.